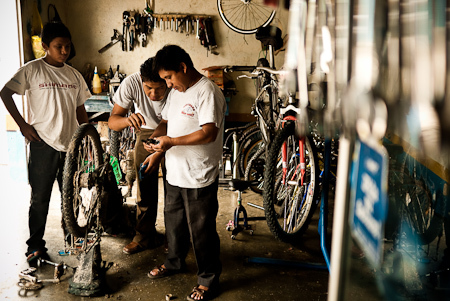 While riding from Flores to Carmelita, I chanced apon a decent bike store in the neighbouring settlement of San Benito. 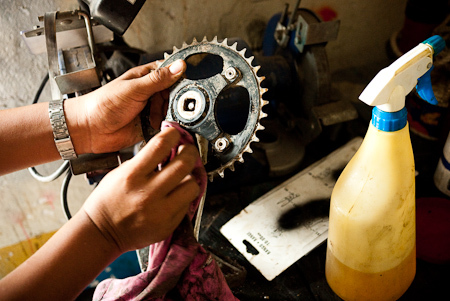 Lurking in the grungy workshop of Chily Wily’s, amongst the cheap and cheerful Guatemala-made parts, was a surprisingly eclectic choice of quality kit – a massive range of Selle Italia saddles, a couple of Deore derailleurs, SPD cleats, multitools. I even found a lightweight mini pump (just 4 dollars) to replace the weighty track pump I’ve been lumbering around with since Mexico. 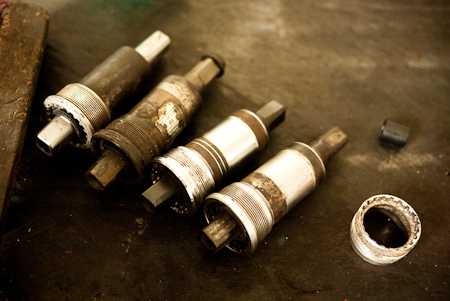 I’ve also been trying to track down a new bottom bracket for some time – or centro, as it is called here. After digging around behind the scuffed glass counter, it was clear there was nothing new that would work. 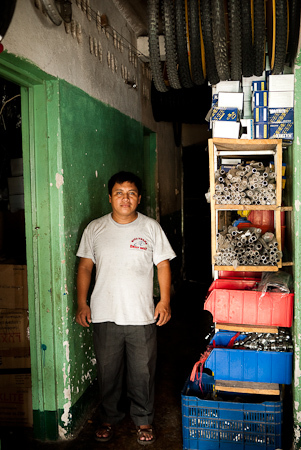 Guatemala is a resourceful land though, so we turned our attention to an oily spare parts box. There we found a cheap, unmarked Shimano unit that kind of fit – once we fashioned a shim from an old washer. In any case, it was better than the one I had before, which had begun to click and grind vociferously in its final death throws, with each increasingly wobbly pedal stroke. 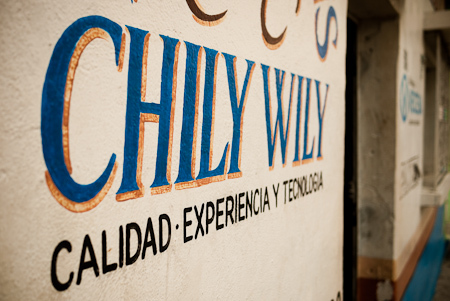 Chily Wily: Quality, Experience and Technology. Guatemalan style. 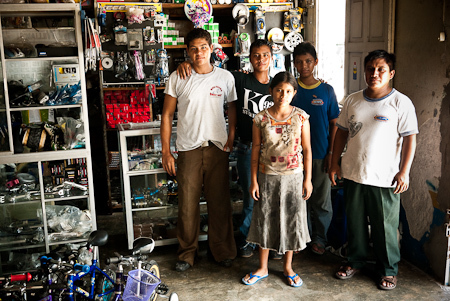 Sourcing a centro was a joint family endeavour. Father and sons set about experimenting with what might fit. 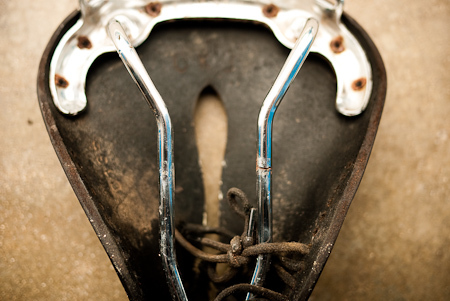 What we had to play with: old bottom brackets from the spare parts bin. For the non-technical, this is the part that the crank arms screw onto. Most of them were bereft of any telltale sizing information. 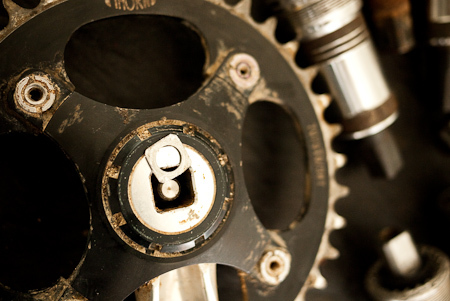 Luckily there were plenty to choose from as I’m running simple, square taper cranks – so a matching bottom bracket can be easily sourced all over the world. The non-drive side crank butted up against the best bottom bracket we could find, so a shim was fashioned to space it out a little. Giving my Middleburn cranks a much needed clean before re-installing them. Number one son: Joni Geovani Zepeda. 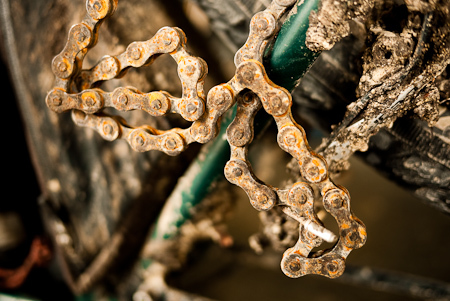 Yes, my chain needs some TLC too. The rainy season is hard on kit - this is what happened after a night out camping. One of the rails on my lovely, Cass-contoured Brookes Imperial saddle has snapped – again. I’m gutted, as this is by far the most comfy touring perch I’ve come across. It held up for ten thousand tough kilometres. I'd still recommend the Brooks Imperial for most uses - I guess it’s just not up to this kind of longterm riding. The man himself, Chily Willy. I left with a bike that felt far smoother than it has for months. And a shop t-shirt they gifted me. Thanks! Cycling family: the Fuentes head out en masse on Sundays to the peninsula of San Miguel, or go road riding in the morning before the shop opens. You can find Chily Wily in San Benito by heading out of Santa Elena in the direction of San Andres – it’s just before the fire station. Big Belly’s is a good licuado parlour nearby with lakeside views. As a side note, owner Big Belly is quite a character too. When I asked him how he spoke such good English, he told me he’d previously worked as a guide. ‘I learned English at the School of Hunger,’ he said, laughing his big belly laugh. It’s a tough school: unless you learn quickly, you go hungry. He’d obviously been a good student. Awesome! You know I love all of your posts, but this one is a classic really. You have a way with words (not to mention photographs), my friend. thanks scott! look forward to catching up! Alright dude, I see that your back tracking instead of heading south…..sounds like you. Remember the night of drinks on the pier in Flores (by the lake). Any shots from that little episode? 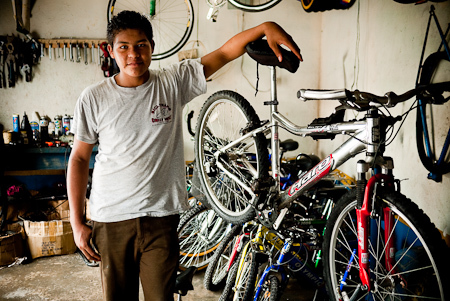 We were looking for a new pair of handlebar grips whilst touring in the Peten and remembered this post. Sadly everyone we asked in San Benito said it’s no longer and at the address there was nothing. This being enterprising Guatemala though we managed to get some decent ones in a nearby hardware store. All for $2.